Hundreds of feet underground a bizarre world exists, a world where streams disappear into cracks in the ground, translucent fins of rock drape twisting passageways, and luminescent spires of rock have slowly grown for thousands of years. There are scores of miles of underground passages in the fractured bedrock of the Driftless Region of Minnesota, Iowa, and Wisconsin. Mystery Cave, Minnesota's longest, stretches for 13 miles. Explorers have navigated 17 miles of passages in Cold Water Cave, which begins northeast of Decorah, Iowa, and reaches across the Minnesota border. Numerous caves lie beneath the hills and fields of Fillmore County alone. Few people see these places. Fewer still risk their lives to discover new passageways, jamming their bodies through tiny openings, dangling over rocky abysses, and diving in freezing cold water beneath the earth's surface. But for some, caving is a life-long pursuit, perhaps an obsession. John Ackerman has gone to tremendous lengths to discover new caverns, as well. The man has rummaged through and shimmied under the wreckage of collapsed sinkholes in hopes of finding openings beneath the precarious rubble. He has used high explosives to blast through sections too narrow to pass through. He has bored entrances through bedrock, and he uses a modified track-hoe (a long-armed backhoe on tank-like tracks) that he calls the "Cave Finder" to excavate sinkholes and create entrances to caverns. He has also spent a fortune buying land above numerous southeastern Minnesota caves. Ackerman owns the access to most of the area's caves and claims to have discovered over 40 caves. "I think what attracts me to it is to be the first person to walk through the inky blackness of the unknown. You're the first human being to shine your light through those passages since the beginning of time," Ackerman said. His enthusiasm for caves, he says, "is like a hobby that just got out of control." Ackerman pointed out the serious danger involved in his choice of activity. "I don't want to say that I'm an adrenaline junkie, but when you do something as dangerous as trying to discover a cave there's a great deal of risk involved. Perhaps the weather can change and you can drown, or if you're in an unstable part of the cave you can hear what sounds like sizzling bacon—that's a rock slide," he described. "In Minnesota we have one added danger: the temperature of the cave is 47-48 degrees. If you're lucky enough only to get stuck in a cave, hypothermia can take you very quickly," he continued. Ackerman acknowledged that what he does is more risky than run-of-the-mill caving. "When you're dealing with explosives in caves, if you screw up once, you automatically die. It forces one to be very careful," he explained. Not all cavers put their lives on the line. "I love thrilling experiences, but I do not have a death wish," said Mystery Cave State Park Manager Warren Netherton. "I do not go into something that I do not fully expect to come out of." Rather than risk death, Netherton and Iowa caver Ed Klosner have devoted years of their lives to mapping caves. Global Positions Systems (GPS) do not work underground, so the mapping of caves is done the same way it has been for decades: by measuring the dimensions and compass bearing of every single room and passageway. Klosner and Netherton have been working on this painstaking process at Mystery Cave since 2006. Netherton estimated they will be done in 20 years. He laughed, but he was not joking. 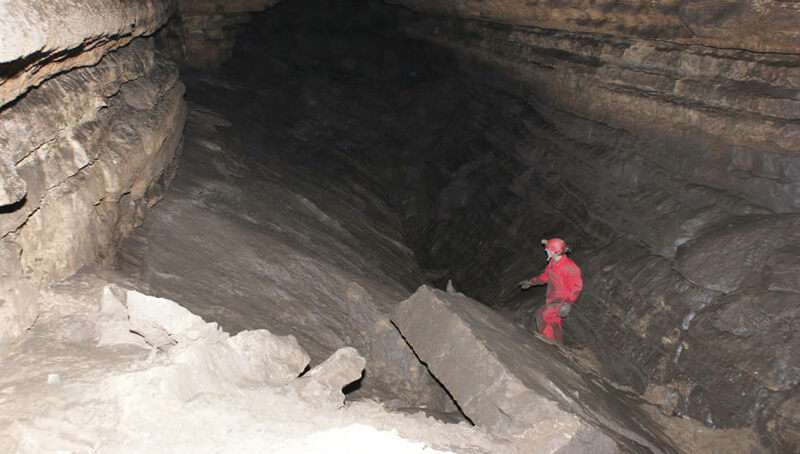 Mapping caves provides an invaluable record for future cavers and scientists. Despite the effort, it has its own pleasure, too. "Surveying caves is exciting because you get to see the spatial relationships of all those interconnecting tubes," Netherton said. "It's a 3-D puzzle to try to figure out how it fits together," Klosner explained. Some have criticized Ackerman's bravado in creating new entrances to caves as detrimental to fragile cave formations, ecosystems, and groundwater. Ackerman contends conservation is his goal. Ackerman has put hundreds of acres above and below ground into a private, undeveloped space he calls the Cave Preserve. He has been undisputedly generous in allowing scientists and experienced cavers to study and explore his network of caves. Climate research, cave mapping, and paleontology take place in his caverns. The skull of a saber tooth tiger was found in one of Ackerman's Fillmore County caves, the northernmost site of such a discovery ever documented. When asked whether expanding access to so-called underground wildernesses is counterproductive to protecting them, Ackerman replied, "That just screams ignorance in huge letters because you can't protect what you don't know exists." Winona State University geology professor Toby Dogwiler agreed that allowing people to experience nature is a key part of conservation. "The best way to protect Yellowstone National Park would be to put a fence around and keep everyone out, but if people can't see how beautiful and special it is, then they won't care about it," he said. "You can better conserve caves by making sure that people have access to them," he added. That said, minimizing one's impact while traveling through a cave is important, Dogwiler said. The oil from human hands can inhibit the growth of stalactites that are hundreds of thousands of years old, so climb and crawl with caution, Netherton advised cave-goers. The greatest threat to Minnesota caves, Akcerman contends, is not humans below ground but human land use above ground. Agricultural chemicals, manure, and other pollutants make their way quickly to cave waters, he said. Ackerman hopes his Cave Preserve will prevent that at Minnesota's finest caverns. "Caving has turned me into an avid conservationist because I realized how fragile southeastern Minnesota is," Ackerman explained. "If a tanker tips over, it's going to run into the nearest cave and everybody downstream is going to be drinking that water for eternity." Klosner described seeing evidence of high-levels of pollution while in Cold Water Cave. "It's eye-opening to be in a cave and see foam in the water from agricultural products," he said. Hydrology ceases to be an abstract concept after being inside the water cycle and seeing groundwater firsthand, Netherton said. "Caves allow you to see where our water goes," he explained. "What a unique place for people to be able to go: between where rain falls on the surface and the aquifers where it goes." "Because of years of marketing, people have an idea that spring water is pure," Dogwiler said. "There's very little opportunity for natural processing and attenuation of contaminants [in Karst groundwater]. Whereas in a non-Karst aquifer there's time for chemicals to break down or absorb into clays." In Minnesota, significant caves only exist in the limestone and dolomite of the Driftless Region. They form when rain water, which is naturally slightly acidic, flows through cracks in the limestone and dolomite bedrock, dissolving the basic (as in high-pH) rocks and creating conduits through the bedrock. "If they are large enough we call them caves," explained Dr. Toby Dogwiler of Winona State University. In those caves, some of the dissolved rock is left behind by dripping water. Over thousands of years, this forms all manner of oddities, famously the spike-like stalactites and stalagmites. All of the deposits are essentially variations on this theme, but an incredible assortment exist. Passages are alternatively decorated with needle-thin "soda straws," ribbons of "bacon," and oozing blobs of once-dissolved minerals. This interaction between bedrock and rainwater makes the region's foundations as porous as Swiss cheese. This Karst topography, as geologists call it, leads to caves, sinkholes, and streams that vanish into the underground.